9/28/2015Share this story on Facebook! 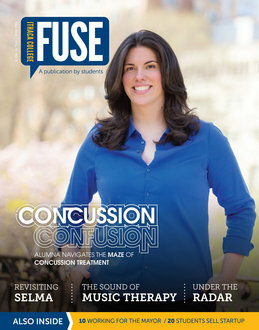 In this issue of Fuse you can read about an alumna who is on the leading edge of national thinking about how concussions are identified and treated, and another alumnus who is part of New York City mayor Bill de Blasio's team, tasked with keeping the mayor in touch with the daily pulse of the neighborhoods in the city. You can learn how undergrads in Professor Bodhi Rogers's physics classes are unearthing forgotten history using 3-D laser technology, and how a group of business students sold the company they started as part of the annual IC Business Idea Competition – before all of them had even graduated. You can also hear from one of the journalism students who covered the events surrounding the 50th anniversary of Bloody Sunday in Selma, Alabama, for NBC Nightly News. Cover Story Concussion Confusion - Jessica Schwartz '05 is getting the word out about how to identify and treat concussions. Working for Change - Harold Miller ’03 is keeping the lines of communication open to the mayor's office in New York City. The Healing Power of Music - Daniela Schmiedlechner ’14 uses music to help children who face communication challenges. Remembering Selma through Storytelling - Candace King '15 on reporting for NBC in Selma for the 50th anniversary of Bloody Sunday. Under the Radar - Professor Bodhi Rogers's students go above and below using 3-D laser scanning technology to find hidden history. Push Interactive: A Beacon of Success - Business students create and sell a company that started out as part of IC's annual Business Idea Competition. Finding Problems, Researching Solutions: The James J. Whalen Academic Symposium provides a unique springboard to the future for IC students. Humanizing Tragedy in Post-Katrina New Orleans - Mia O’Brien ’15 and a group of Park scholars document resident's stories. Fine Tuning a Music Classroom - Madeline Docimo’15 seeks a sustainable future for high school music programs. OT Students Take Steps Toward Change - Group participates in Occupational Therapy Advocacy Day in the New York State capital. For the Love of Leadership - Students hone leadership skills and self awareness on a weekend-long retreat. IC Grad Joins Google Team - Marc Howard '11 software engineer on the company's idea team works to make digital resources available worldwide. Managing social media for CBS Evening News - Dylan Lyons ’14 brings CBS’s Scott Pelley up-to-date on social media. Graceland Director Visits IC - Larry Teng '99 stresses organization and preparation as crucial to success. Faculty Focus: Alison Shields - Assistant professor studies the role nostalgia plays in marketing. Opera Workshop - Class premieres original work by IC professor Dana Wilson.